Choose a color that complements your unique style and crafting table frame. You may later pick accessories that match your frame color. This crafting table is made to help you move! Choose our active mat to stand comfortably, stretch, and switch postures throughout the day. The right lighting can help you finish your projects quicker and with less eye strain. From desk lights to floor lamps, we have what you need. Fully assembled and ready to store! We recommend a filing cabinet that matches your frame to help you organize your tools and supplies. Crafting takes a lot of power, which takes cords. Organize them with a wire management kit that moves up and down with your table! Free! Add a combo of accessories on us, including a standing mat, which will deliver you to a new level of comfort at your table. For a limited time, snag a few more accessories to outfit your new crafting table or give as a gift - completely free, of course! Side tables free up valuable space at your table that's better spent crafting. Keep printers, supplies, and tools close by but off your work surface. Tame and route your cables around your table with this Magnetic Cable Organizing Channel, which sticks to your table frame in a snap! Keep power within reach on your desk with an attachable power option: The Clamp-on Surge Protector. Our sturdy frames are powder-coated to perfection and treated with a nontoxic finish, so you can breathe easy. Take a look at our legs. Where other height adjustable frame makers offer 2-stage frames standard or "extended range" 3-stage frames for more money, we offer only the most affordable, reliable, fastest adjusting, and quietest height adjustable bases with our 3-stage frame. Our competitors offer less stable 2-stage frames that are slower to adjust - 33% slower to be exact. That's because our 3-stage frames feature three small spindles in each leg versus the standard two that come in 2-stage frames. This allows you to raise and lower your craft table faster, and provides you a much more enjoyable overall experience at your table. This design also lets the frame adjust to higher and lower heights, so it fits a wider range of users, making it ideal for multi-user workspaces. If your goal is creating an optimally ergonomic workstation, you need to know this: 2-stage frames' reduced range of height adjustability means that at its lowest height setting the table will not reach a spot that places your keyboard tray at an ergonomically correct height. The frame's upper height is also reduced, meaning taller users may not find these frames suitable for them. You also cannot add a treadmill to your work setup later on when using a 2-stage frame, meaning your crafting table will have fewer ergonomic options for adapting in the future. Our 3-stage frames boast powerful motors in each leg, which give you the stability you need to safely raise and lower your crafting table. A lower weight capacity on 2-stage frames limits the amount of gear you can keep on your workstation. They are also more prone to overloading or breaking, which would put you, your crafting table, and your equipment at risk of significant damage if loaded a few pounds over the already reduced weight limit. 3-stage frames come with a safety reverse sensing feature, so lowering your crafting table onto your things will not be an issue. But it would be on a 2-stage height adjustable frame, as it does not have this safety feature. Want a quiet crafting experience? Single motor and 2-stage frames are typically louder when raising and lowering, whereas our 3-stage frames are whisper quiet by comparison. Invest in a height adjustable frame that's there for you for throughout the highs and lows at work with UPLIFT Desk. Light up your projects with the Illuminate LED Task Light. The head rotates and swivels to direct five levels of brightness and three color temperatures exactly where you need a little extra light. The features don't stop there, a USB port in the base lets you charge your mobile devices from your tabletop. And the soft blue nightlight in the base automatically turns on to provide gentle, ambient lighting when the task light is not in use. Light up your life, or at least your office, with the E7 Desk Lamp with Clamp. This desk light clamps onto the edge of your desk to bring ambient lighting to your work area. The desk lamp is available in black, white, and blue to match a multitude of UPLIFT Desk accessories. Another great thing about the E7 Desk Lamp with Clamp is its ability to transform from a clamp-mount into a regular desk lamp or floor lamp with the addition of the optional desk base or floor base. Simply remove the clamp mount and insert the lamp into the new base. Watch this transformational lamp take on a new form in front of your eyes while the light transcends to reduce eye strain felt from staring at your crafts or at a computer screen all day. Add the 2-Leg Side Table to your UPLIFT Sit-Stand Crafting Table for extra storage or work space. The Side Table is available in the same frame color and top style chosen for Sit-Stand Crafting Table, natural rubberwood. Or, choose a different style completely! The only decision you need to make is what size will best fit your space. This fixed height side table will complete the cohesive look of your crafting space. While a stand-up table is great for your primary workspace, a side table is an ideal place to house your printer, books, or anything else you need nearby, but don't necessarily need to be able to stand up to use. Craft and create with seating and storage in one with the 2-Drawer File Cabinet with Seat, Rolling and enjoy the functionality of a multi-tasking piece of furniture. This file cabinet comes in black, gray, and white. A storage tray can be added to the top drawer for more organization. Plus, hang legal or letter-sized files in the bottom drawer, perfect for your large sewing patterns. And easily lock the cabinet for security for your materials and supplies. Want a clean and clutter-free craft area, but don't have enough storage space? Add the 3-Drawer File Cabinet to your crafting Table and enjoy working with additional storage for all of your passions. The top drawer of the file cabinet locks to securely stow valuables, while the bottom drawer holds letter and legal sized paper, like instructions or manuals. Casters let you roll and store your file cabinet wherever it is needed. Order your storage system in black, gray, or white. Enjoy having power and surge protection combined with our Clamp-on Surge Protector with USB Charger which can attach to your craft table frame (and can also be paired with all of our wire management options). The UPLIFT V2 Height Adjustable Crafting Table features over 4 cubic feet of storage, with three drawers and two hinged compartments. Store all kinds of tools and supplies for your favorite hobby—whether that's sewing, drawing, painting, sculpting, or beading. The UPLIFT V2 Frame supports up to 355 lb and can adjust the height of your craft table a total of 25.6". The UPLIFT V2 Commercial Frame has a lower minimum height and 26.1" of adjustability. These patent-pending mounting points are built into the frame of your crafting table so that you can attach UPLIFT Desk accessories without drilling new holes. Your height adjustable craft-and-hobby table gives you the flexibility you need to work effectively, whether sitting or standing. Make an investment in your craft that will help you stay organized and comfortable—leading to more completed projects. The UPLIFT V2 Height Adjustable Crafting Table is symmetrical, enabling you to work from either side of it to get the best angle on your project. Unlike some wooden tables, the crafting table's drawers are easy to open—just use the hand grip under the face of the drawer. How is this craft table better than my current crafting table? The UPLIFT V2 Height Adjustable Crafting Table was designed to extend the ergonomic experience beyond the office, providing you with a more comfortable craft workspace. Working in ergonomic postures enables you to complete your projects more quickly and enjoyably. You'll also be able to combat fatigue by switching up your posture throughout the day. Lastly, this craft table provides storage space all along its length. You have five separate areas in the table to keep your yarns, watercolors, or jewelry-making supplies within reach. Will this hold my fabric swatches and sewing materials? In most cases, yes. Our designers were able to fit a large amount of crafting supplies, materials, and tools inside the table's five drawers/compartments—including sewing materials, fabrics, and craft books. 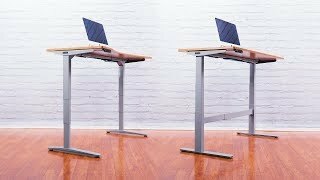 Is the UPLIFT V2 Height Adjustable Crafting Table suitable for sewing? Yes, with a spacious 60" W by 30" D surface, this crafting tabletop is perfect for sewing and has enough room to hold sewing machines of most sizes. If you have a larger machine, please give us a call at 800-349-3839. We'll be glad to help you figure out if this is a suitable table for you. Which desk accessories can be used on this table? While the Clamp-on USB Surge Protector can be used with the crafting table, accessories like monitor arms, the hanging storage cubby, clamp-on acoustic privacy panels, and power grommets are not compatible with it (due to the table's thickness). What are the pre-drilled holes on the bottom of my craft table for? Those holes are pre-drilled to allow you to attach your table to your frame more easily. They're also conveniently spaced to fit our 2-leg side table desk frames, if you ever want to adapt the table in the future. What new features are included with the version 4 control boxes? Our newest control boxes come with a handy safety feature which lets you choose how sensitive (from one to three) the craft table's anti-collision mechanism is. You decide when the table should stop if it bumps into something during a height adjustment. The keypad lockout lets you keep others from adjusting your table's height (when activated). You can toggle between one-touch and constant-touch height adjustment modes (with just a few buttons). Change between inches and centimeters on the keypad display. This craft table is designed to hold a whopping 355 pounds. That is a lot of craft supplies and tools! What happens if my table stops working after my warranty has ended? No worries—if your craft table malfunctions after the warranty period has ended, you can contact us for access to affordable replacement parts.